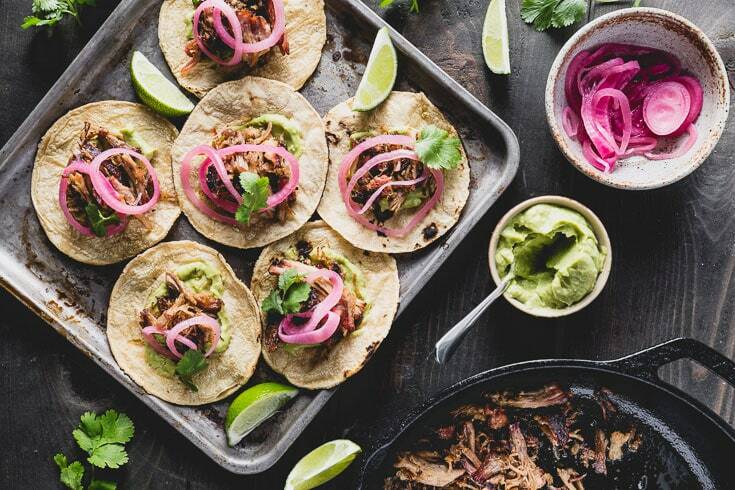 Nothing says Cinco de Mayo like colorful and super flavorful tacos. 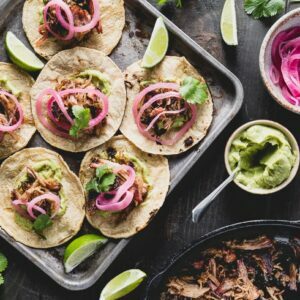 Carnitas Tacos, AKA pulled pork tacos that are crisped-up and served with a velvety avocado-lime crema are one of the more wonderful things in life. I don’t know about you, but I love myself a simple taco with really good stuff inside. 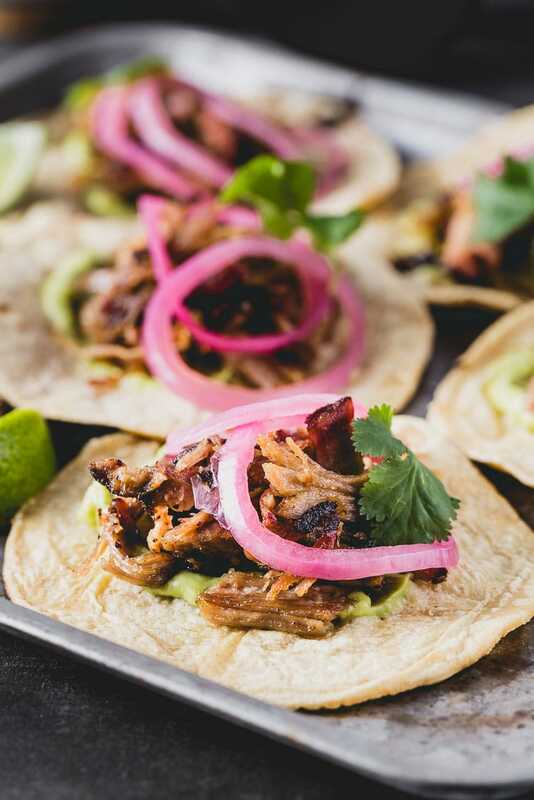 A simple taco that is super balanced with “stuff” like 7-hour smoked pork shoulder, quick pickled red onions, avocado-lime crema, and cilantro. Smoking a pork shoulder for 7 hours is totally optional. Any shredded pork will work. You can cook pork in an instant pot, slow cooker, or whatever method you choose. 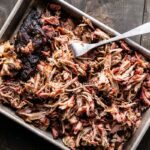 But if you do want smoky amazingness, you will definitely try my low and slow smoked pork shoulder recipe. I prefer my carnitas to be pork shoulder that is smoked low and slow, then shredded and crisped in a cast iron skillet. 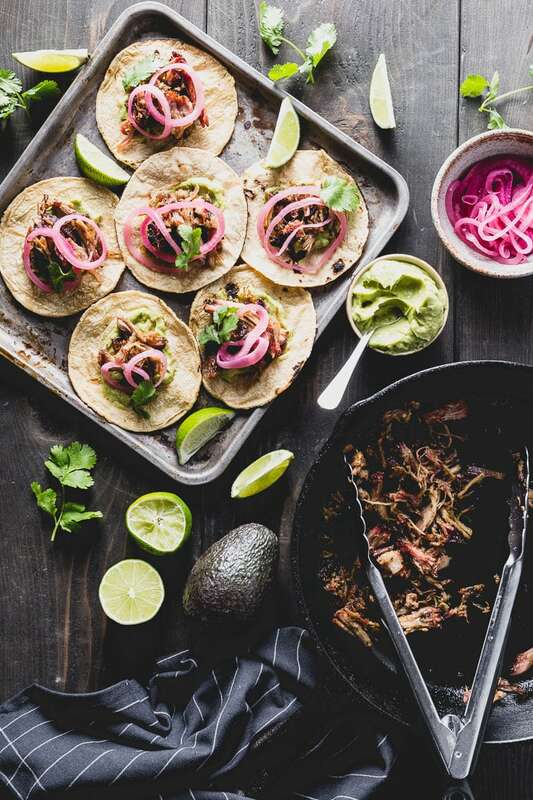 As much as I love Mexican carnitas, this version is a bit of a hybrid between BBQ pulled pork and the Mexican version that is often braised for hours. 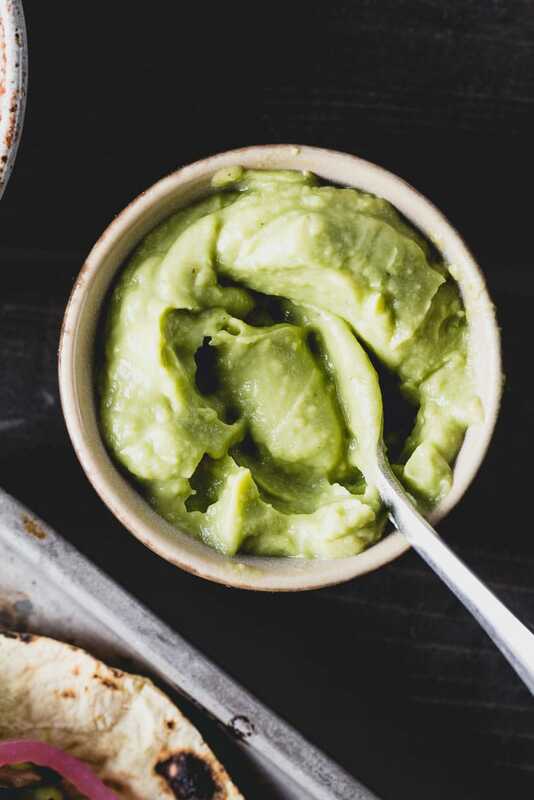 Avocado-Lime Crema is really just a taco friendly version of guacamole that is puréed with a squeeze of lime and some seasoning. 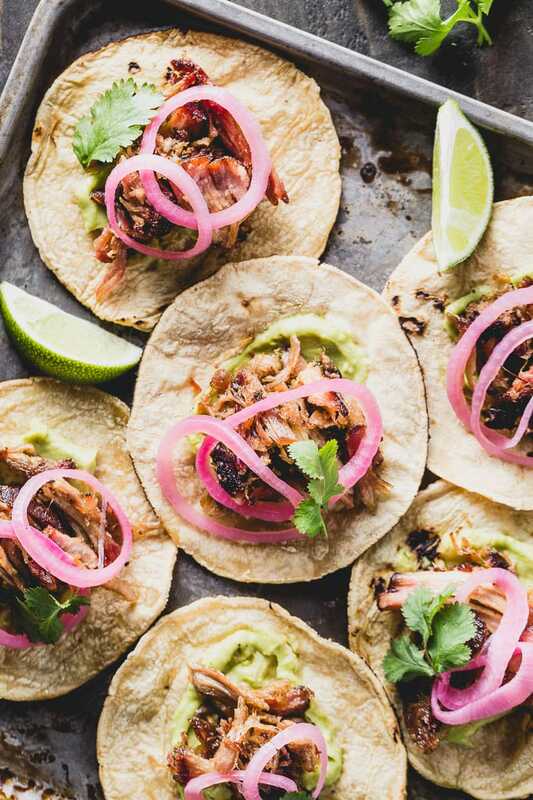 Quick-pickled Red Onions add an amazing brightness to the tacos. By quick-pickled, I really mean they are quick. Ready in just 30 minutes. Once you make these, you will want to put them on everything. They store for weeks in the fridge, so make extra. 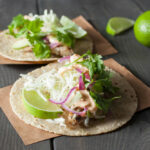 Once everything is prep’d and ready to go (which can be done ahead of time), you are ready for your little taco party. I like to heat the tortillas over the flame on the stove or grill. This chars them ever so slightly (or excessively if you aren’t careful) and gives a great smoky flavor and slight crunch. 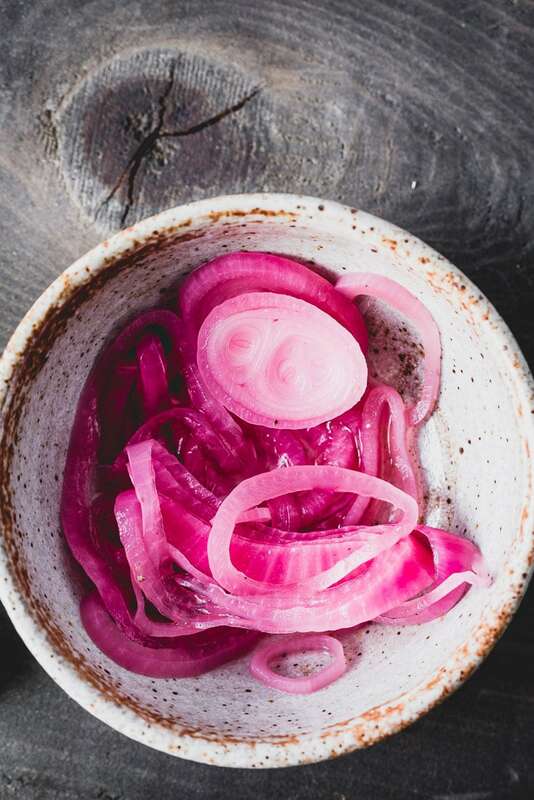 Place the sliced onions in a small strainer and pour a few cups of boiling water over the top. Combine all the remaining ingredients in a glass jar or a small bowl, stirring to dissolve the sugar and salt. Add the onions to the pickling liquid and let sit at room temperature for 30 minutes to 1 hour. Placing in the refrigerator will stop the pickling process. Blend all of the crema ingredients until smooth. Cover tightly with plastic wrap if not using right away. Heat a cast iron skillet over medium-high heat with a drizzle of canola oil. When the skillet is hot, add the shredded pork and let it start to get crispy before stirring. You just want to warm it through and get the edges crispy. Warm the tortillas in a skillet or over a gas flame on your stove. 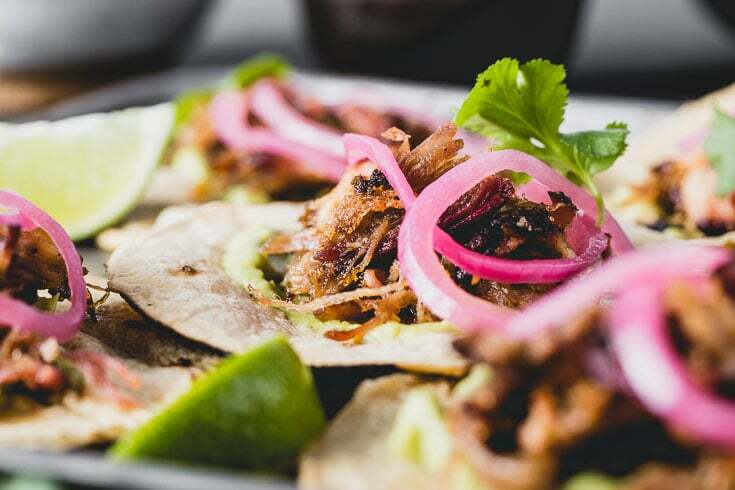 Spoon the avocado crema onto the tortillas, followed by the pork, pickled onions, cilantro and a lime wedge. Any carnitas will work, but I recommend my Smoked Pork Shoulder recipe. 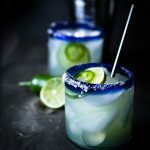 A super delicious and refreshing Mezcal Margarita recipe with jalapeños to give it a kick and the smokiness comes from the Mezcal.